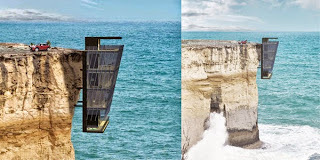 Home » Lifestyle » Places and Travels » Tourism » Australia To Build A Getaway House Hanging On The Cliff? Australia To Build A Getaway House Hanging On The Cliff? Overcome the fear of heights, dare to spend some time living in a Cliff House that is about to be built on the side of the cliff on the southwest coast of Victoria in the country of Australia. Is this really the key treat your acrophobia? The location said to be the perfect place to treat the fear of high places by anyone, the house hanging on the edge of the cliff. It is the idea of Modscape Concept, as where Cliff House is a five - story vacation home that is designed to build on the southwest coast of Victoria in Australia, which can only be accessed through the carport from the top floor and the elevator down to each floor. Although this is all concept alone, the building is solid. The house is made of pre-fabricated modules that interconnected at the edge of the cliff by the use of steel pins. Thank you for reading Australia To Build A Getaway House Hanging On The Cliff? posted on the website Kwentology if you want to redistribute this article please include the link as the source. Have some kuwento to share? Contact us!